I can’t believe I didn’t post the first trial run of this highly anticipated recipe that Robert and myself conjured up last summer. You can’t possibly understand how upset I am with myself over this. I really liked that beer and was really looking forward to making it and trying it out. ‘Creeping Charlie’, or simply ‘Creep’, was made with pale and dark liquid malt extract, Cascade hops and a whole bunch of freshly harvested ground-ivy (Glechoma hederacea), which is a thin, sprawling perennial herb in the mint family with fragrant, kidney shaped leaves and small purple tubular flowers emerging in late spring and early summer. It was ‘heady’, bold, more well-balanced than bitter, and strange. So, it’s the kind of stuff I like. 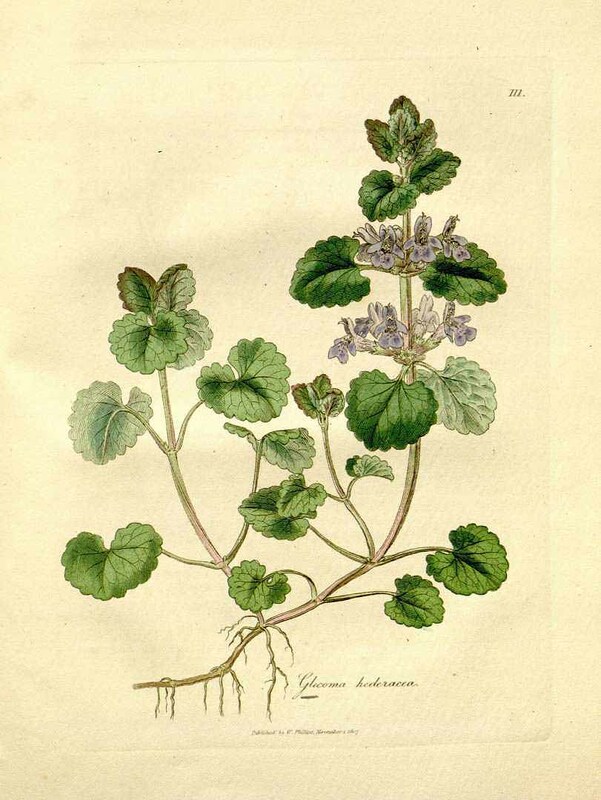 Ground-ivy, also known as creeping Charlie by some gardeners, is an easily overlooked plant native to temperate and northern Europe (invasive in North America) that has a rich history as a hop-substitute in traditional beer recipes. It was deliberately added to batches to add it’s own slightly minty, floral bitterness and to make the beer more ‘heady’ due to the saponins (chemicals that produce suds) contained in the plant that boil into the wort. Unfortunately, the use of ground-ivy practically vanished after it was replaced by hops as the standard bittering and preservative herb in the late 1800’s via the German Beer Purity Act which expanded later to include all of Europe. The exact amounts of ingredients added to the first recipe have been lost due to my terrible book keeping skills, that thankfully since last year, have improved considerably. So this time around, I actually decided to do the responsible thing and carefully measure out everything that I could and write it down. Brilliant. Just making some delicious beery soup. – This is my favourite ingredient: a large paper LCBO bag loosely stuffed about halfway with the dried, uncut trailing flowering stems of ground-ivy. Understand how much that is? Good, let’s proceed. For the sake of not being incredibly redundant, I am going to keep this procedure short and sweet, as they say. If you would like more of a how-to / common mistakes / details guide to making beer in your kitchen, please consult my past 2 or 3 posts where I discuss the specifics of doing this properly and not like someone that’s going to wreck their whole kitchen and spoil their beer. Thanks friends! Bring water to a boil. Add malt extract, about 85% of the ground-ivy, and maybe-Cascade hops. Set timer to 60 minutes and stir ingredients in until a boil has returned. After 30 minutes has passed, add the Fuggle hops and stir them in a bit. 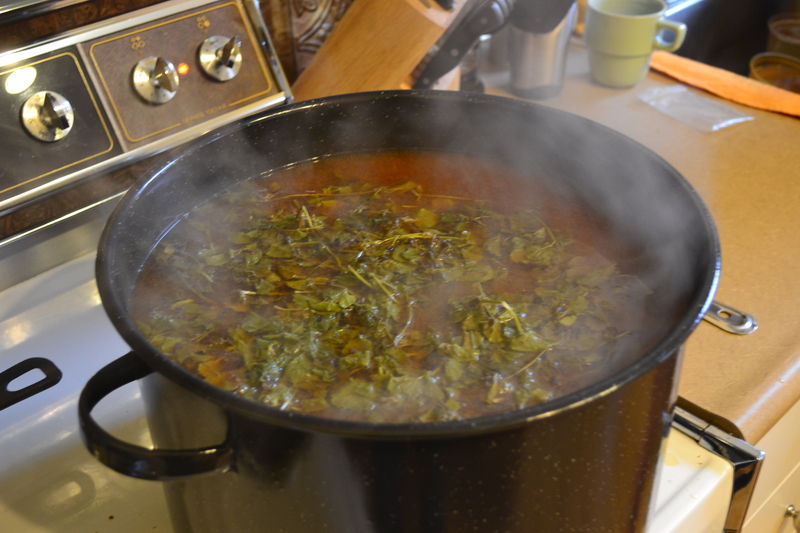 After 50 minutes have passed, add the Irish moss tablet, the rest of the ground-ivy and the Perle hops. Stir until the tablet dissolves, about 3-5 minutes. One the timer stops, remove the wort from the heat and leave to cool to room temperature. Once cooled, strain into your fermenter and top up the water level until 5 gallons is reached. Stir to mix, pitch yeast and insert airlock. I really enjoyed the infamous Creeper 2012. It was a very interesting experiment and I leaned a lot about the flavour profile, aroma and texture that it infuses into the beer. It was more of a sweeter, porter / weak Belgian ale hybrid that was a bit all over the place. Oh, that’s right! We also added brown sugar to the recipe. I remember that now. That is what gave it the sweetness common to candied ales which are made with caramelized sugar. So yeah, it was pretty wacky and unpredictable. Probably fooled around a little to much, but whatever. It’s whatever it was and I enjoyed drinking it, especially after it ages for around 6 months to a year. It chilled out a bit. But the allure of an American Pale Ale that’s quite malty, but also refreshingly bitter, citrusy, and possesses that dark, floral bitter-mint spice of creeping Charlie. Here’s take two.